The blog was quiet last week because we were on the Laurence M. Gould, sailing across the Drake Passage back to Punta Arenas, Chile. After spending 31 days at Palmer Station, about half the Project CONVERGE team are on their way home. Back at Palmer, the radar stations and the gliders are still gathering data for us. The krill and penguin teams, plus one stalwart member of the glider team, will remain at Palmer until the Gould’s next visit, on March 11. As an example of the ways the scientists will be combining data when they get back, here’s a graph of chlorophyll readings that caught Dr. Oliver’s eye. This was recorded by a glider in early January during a single dive from the surface down to 100 meters (330 feet). To read it, imagine you’re a glider diving from the top of the graph straight down to the bottom. Pretend the green line is your chlorophyll meter—the farther it goes to the right, the more chlorophyll is in the water. 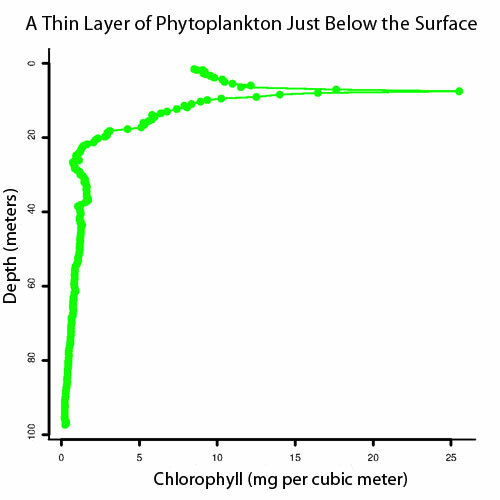 The amount of chlorophyll is a fairly good measure of the amount of phytoplankton. Dr. Oliver wonders if this density layer is helping to concentrate phytoplankton in addition to, or possibly even more than, the effect of convergences at the surface. But to know how important this is to the big picture, he needs to add in results from krill surveys and penguin tracks. He also needs to analyze the whole set of glider tracks, not just this single plot from one hour of one day. It’s this sort of painstaking office work that will occupy the scientists during the next stage of the project. This is what the scientists have to make sense of now: the grid of tiny arrows represents the radar data; the long colored lines are tracks of gliders and penguins; and the colored dots close to Palmer Station (top center) show the krill surveys. At the moment, the data the scientists are heading home with is like an enormous pile of spaghetti. 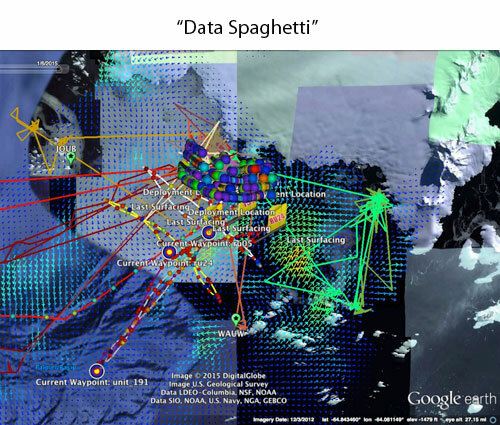 The image at left shows a snapshot of the radar data with the tracks of the gliders, the path of the krill team’s echosounders, and the tracks of the tagged penguins laid on top. Each one of those dots represents a separate set of data, like a plate of noodles, that needs to be untangled, straightened out, and then recombined to answer the specific questions the scientists come up with. They’ll be starting that untangling process this spring. Then they’ll get together in June to plan out the full analyses that, in a year or so, will give them formal answers to the questions they came down here with. We’ll be back tomorrow with one more post about Palmer Station. Thanks to everyone for following along with us on our long expedition.